Menopause causes fluctuations in hormone levels, including estrogen, which helps regulate mental function in the brain, including how the brain processes memory and concentration. Memory lapses, inability to focus and disorientation are all linked to this problem and may worsen as a woman progresses through menopause. Yoga is a popular meditation method worldwide. Yoga aids in clearing the mind, whilst also being a form of physical exercise. Joining a class in yoga or other meditation techniques can help improve your concentration levels. Take time to indulge in a good book. Many people find that reading before bed helps calms the mind and aids sleep. Trying to recite a passage from the book may also help. This can also be an important concentration exercise for those having difficulty, and help your mind practice focusing on things. 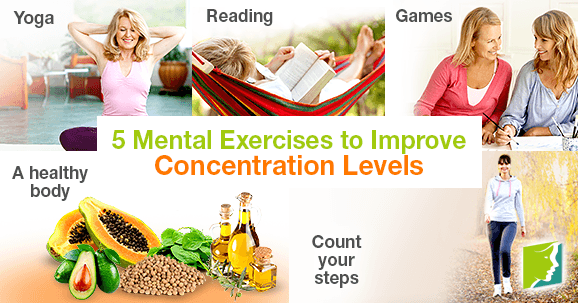 Playing games can be a fun way of improving concentration levels. As mental exercises go, crossword puzzles, Sudoku, and word searches improve alertness and focus your mind. There are a variety of other games that can help improve memory retention and concentration, so it's easy to find something fun to do in your spare time. Maintaining a healthy body helps to regulate hormones and ward off other complications like breast cancer. Getting all the vital nutrients the brain needs to function well can make a huge difference. Soy isoflavones and vitamin E can help alleviate problems caused by estrogen deficiency. Simple sugars and caffeine should be avoided, as they can worsen symptoms. This is a technique whereby you inhale for six steps, before holding your breath for six steps and then exhaling for six steps. This can help alertness and focus of the mind and is ideal to practice if you face an unexpected and stressful situation. With a clear mind you are more likely to be able to concentrate for longer periods. If you are concerned about your concentration problems or memory lapses, always talk to your doctor. To find out more about treatment for memory lapses, follow this link. Dr. Devi, Gayatri. "Memory Loss, Estrogen, Menopause & Alzheimer's Disease". The New York Memory Services. www.nymemory.org. Dr. Devi, Gayatri; Hahn, Katherine; Massimi Stephen; Zhivotovskaya, Emiliya. Prevalence of memory loss complaints and other symptoms associated with the menopause transition. Gender Medicine, 2005, vol. 2. Myers, Catherine E. "Categories of Memory Systems". Memory Loss & the Brain. www.memorylossonline.com. "Memory loss and menopause". News-Medical.Net. www.news-medical.net. Keep reading to learn how diet and other lifestyle habits can worsen memory loss issues during menopause. Memory loss or lapses in cognitive function are common during perimenopause; read on to learn ways of discovering if you are affected by "brain fog". Keep reading to learn how herbal teas can help to correct the hormonal imbalances that cause memory lapses during perimenopause.